wow that stone road looks really good!!! great texture for a tourist road ! After few additionnal tests, I think the water mesh method could be really good as a temporary solution for flight-sim oriented sceneries like mines. As mentionned previously, the Chapala mesh is really good but too big to be exploited simply. It's possible to modify the model orientation, but with a mesh of this size, a degree modification in the slope at the point of origin result of a hundred meters elevation at the other side of the model . I'm convinced it will be possible to get a good result with a limited set of various smaller mesh, even really simple (rectangles, circles - of different size), wich could be placed and oriented easily. Would you be interested to expand your work in that direction ? 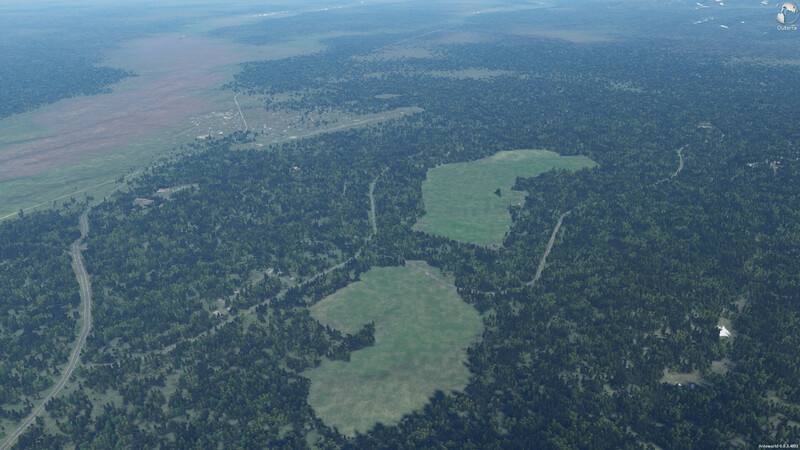 I can see a lot of roads on stuff in the second screen shot... Looks really nice! have you made all this? Are you working in some specific project? Depending on what you are doing, I could find a way to accomplish it. Indeed i have made several approaches before modeling the entire lake. It's also hosted as an .otx file in OuterraMods. I've a really limited knowledge in 3D modelling, so I don't know if it's complex or even possible. I really would like to do this, but there is one point to consider. I get to model meshes that can fit in almost any scenery and you get to fill it... We both put a lot o effort on it, and a week or a couple of months later, voila!!! the support for rivers and lakes is released by OT team... We could see our work flooded with "real water". See my point? Would be good to know how far is that possibility. If it is not near, I would love to do it... really! 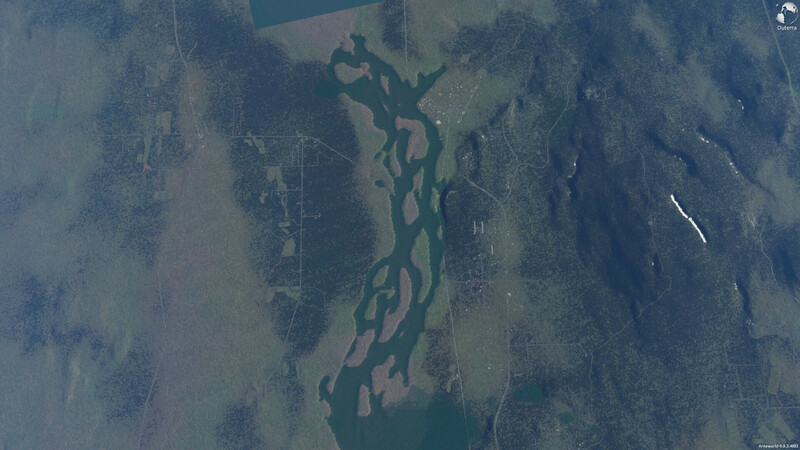 Water mesh will be a temporary solution, that's why I don't think you should spend too much time on it (for example, don't try to do a single mesh to perfectly fill all the Talkeetna river, like you have done with the Chapala lake). For the official lake and rivers vector support, I'm not even sure the dev team can give a precise answer but I bet on at least six month - one year before we see it appear in the engine. O.k. Let's do it. I can't put so much time on this, so be patient, please. Does anybody know the biggest size that can be handled in OT without problems? Not sure ... but even if there is a limit, segmenting stuff in different LODs (well in this case, two would be probably enough) in the proper dimensions should work to overcome that. Here it is. Is not perfect, but will do the job. I guess 1 square km. is handleable. I knew that the biggest problem would be the seams. Under certain light conditions and depending on your view angle, you would notice the union between two meshes, no matter how well aligned this are. But is hard to tie two meshes; is confusing. So I will give you a square dummy; install this .otx first, place your meshes and after that install the final version. It will overwrite the previous; the seams won't disappear, but will be less noticeable. One mesh is enough to cover Vulcan Point, Taal Volcano - Luzon, Filipinas. 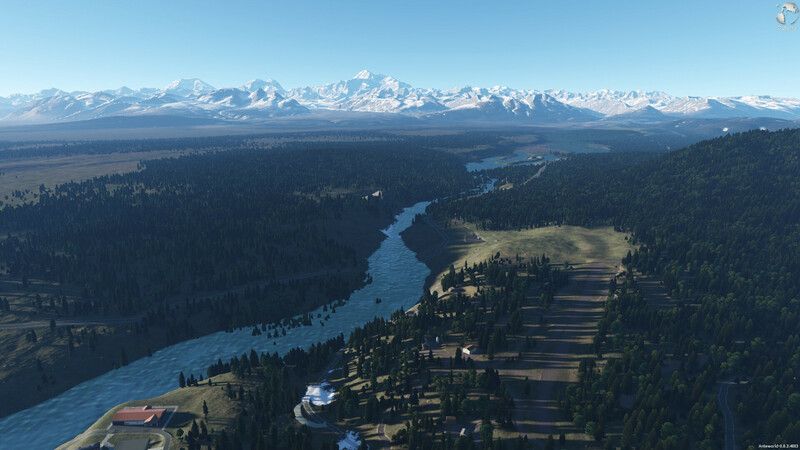 I've run few tests in the Talkeetna scene. So far it's perfect, but there is only one minor problem related to water opacity of the final version. As you can see, the the texture opacity in the final version makes the terrain under the water too much visible, more even if the mesh is really close to the terrain (wich happens a lot during my tests. I hope other fellow Outerrans will use it too ! I remembered the video from Queenstown Airport where the lake was dry .. I have given a new lease with the mesh of kw71.